Colors Purple is Benetton's perfume for women who know the positive power of diversity and are unafraid to celebrate the union of colors to create a better world. 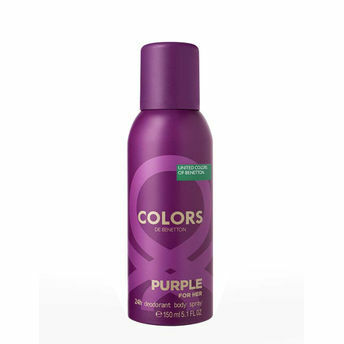 United Colors of Benetton Colors De Benetton Purple Deodorant Body Spray keeps you fresh all day long. Explore the entire range of Deodorants/Roll-Ons available on Nykaa. Shop more United Colors Of Benetton products here.You can browse through the complete world of United Colors Of Benetton Deodorants/Roll-Ons .